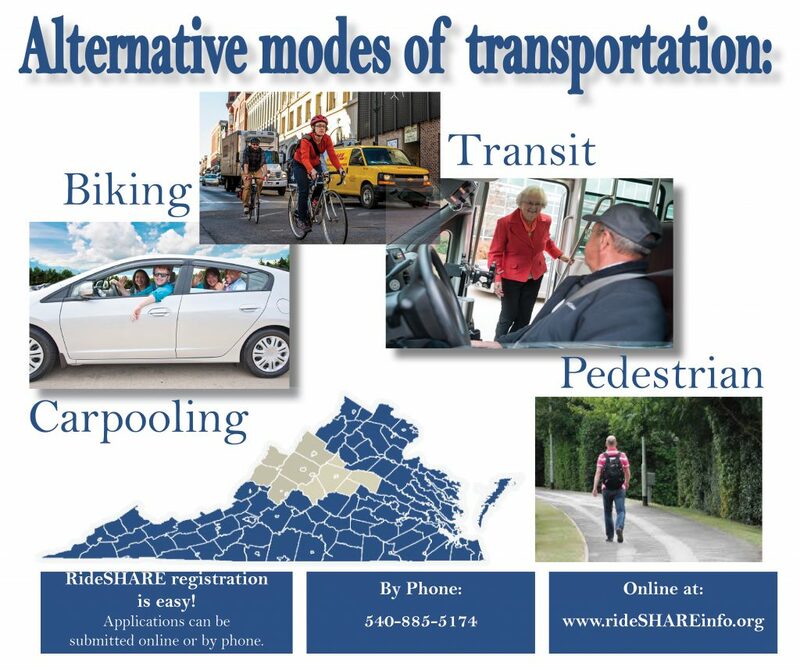 Rideshare is a program of the Central Shenandoah Planning District Commission and the Thomas Jefferson Planning District Commission that provides outreach and other services to reduce single-occupant vehicles on the road by facilitating the use of alternative transportation. Alternative modes of transportation include carpooling, pedestrian, biking, and transit. Rideshare serves the cities of Buena Vista, Charlottesville, Harrisonburg, Lexington, Staunton and Waynesboro; and the counties of Albemarle, Augusta, Bath, Fluvanna, Greene, Highland, Louisa, Nelson, Rockbridge and Rockingham. 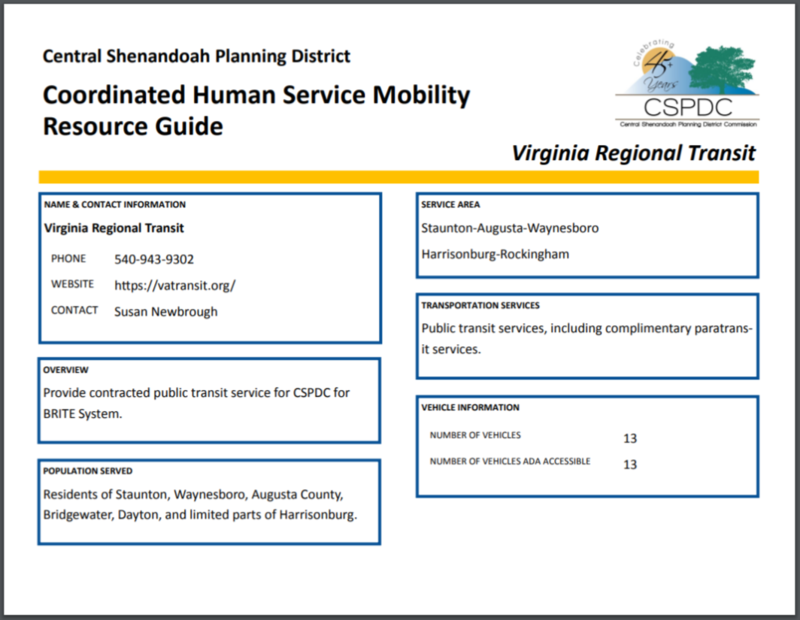 The Central Shenandoah Planning District Commission (CSPDC) created the Mobility Management Resource Guide to house regional human service agency and public transportation provider information in a consolidated location. The Resource Guide provides information such as agency contact information and overview, transportation services provided, population served, and service area. Each agency has its own page that outlines all information regarding services. 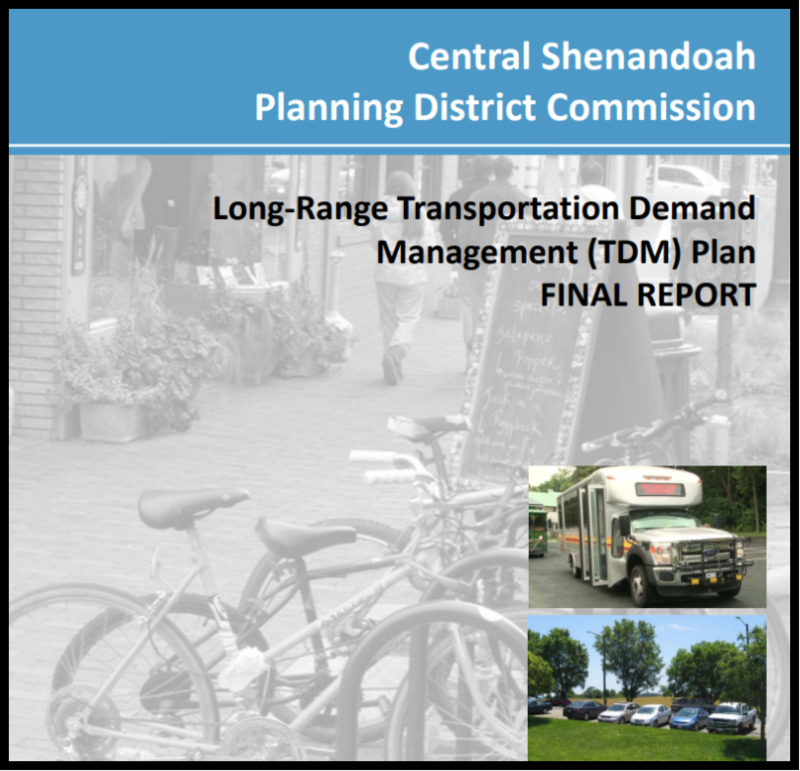 The Central Shenandoah Planning District Commission (CSPDC) adopted the Long-Range Transportation Demand Management (TDM) Plan at its October 16, 2017 meeting. The TDM Plan includes an overview of the region's transportation demand management program and existing services and staffing. Development of an updated mission, goals, and objectives will provide additional guidance and direction to the program. Additionally, the plan includes the TDM program organization and operations review; service changes and expansion; financial plan; and TDM program monitoring and evaluation. CSPDC provided input, assistance, and review during the development of the plan to Michael Baker International, the lead consultant. The development of the strategic plan balances initiatives that are attainable and inspirational. A total of 23 strategic initiatives were developed, including augmentation of existing efforts and entirely new projects. All initiatives were stratified into five categories - marketing and community outreach; carpool/vanpool/ride matching; employer services; alternative travel mode promotion; and TDM and regional planning and coordination. 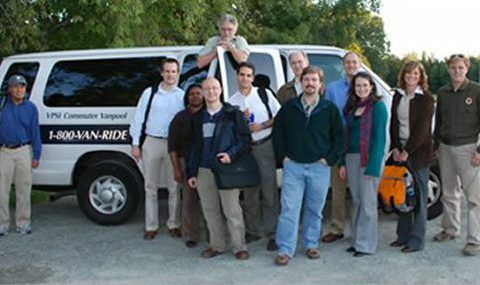 CSPDC's TDM program began in 2009 with the receipt of a Rideshare Transportation Demand Management grant for the Virginia Department of Rail and Public Transportation (DRPT). 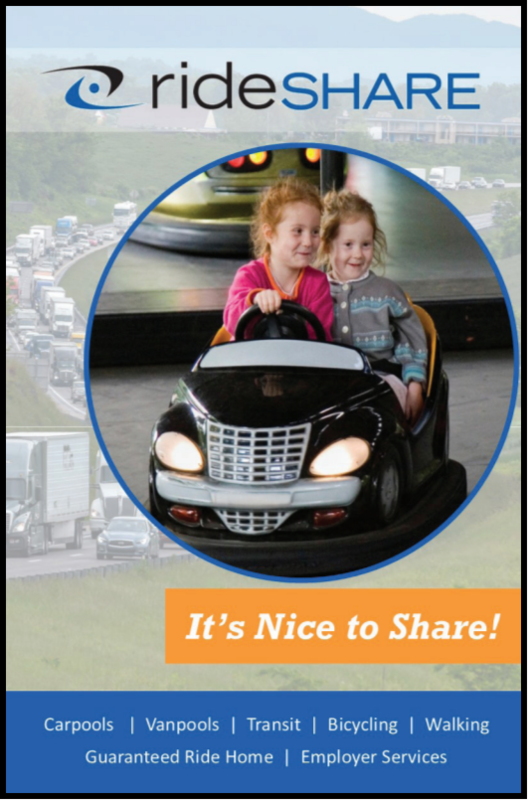 TDM programs throughout Virginia promote ridesharing and other transportation alternatives to single-occupancy vehicles. This helps assist individuals seeking transportation options to their workplaces and other destinations, mitigate congestion on Virginia's roadways, and reduce environmental impacts caused by vehicle emissions, roadway expansion, and other transportation-related factors. Click on the map below to see the listing of and for information on the region's Park and Ride lots.